The Digital Competency Framework has 4 strands of equal importance, each with a number of elements. Children throughout the school have opportunities to develop Digital Competence Skills as part of a challenging and progressive curriculum. 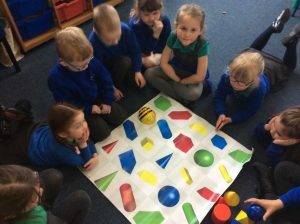 Reception children learning the names of 3d shapes and developing their problem solving skills. They controlled the device by creating and listening to instructions.